On Thursday March 5th ecoartspace will join with several other NYC non-profit art spaces for Soho Night. There will be special events, exhibitions and programs from 6 - 10 pm. 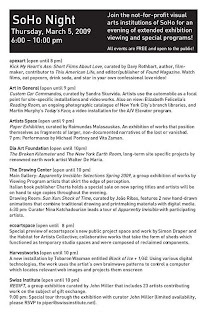 (see list) For this event ecoartspace will stay open until 8pm so please visit us on the early side. The public opening for the new ecoartspace NYC project room at 53 Mercer Street in Soho will be on Saturday March 7th from 12 -6pm. The first ecoartspace project at Mercer St will be Simon Draper's work with the Habitat for Artists Collective which began in Summer 08 in Beacon, NY. In that original Habitat for Artists project Simon Draper supplied each artist with a basic shed (6 x 6' with doors, window and skylight). These collaborative works take the form of sheds, that literally functioned as temporary studio spaces and came outfitted with doors, windows and skylight. The materials used in the creation of the structures consists of reclaimed components and each artist in the collective creatively adapted their shed to suit their own needs. (read more details in the November 13th blog post on the HFA project). For this new version of HFA, Draper's collaborators include artists Chris Albert, Richard Bruce, Sharon L. Butler, Ryan Cronin, Kathy Feighery, Marnie Hillsley, Matthew Kinney, Grace Knowlton, Michael Natiello, Sara Mussen, Steven Rossi, Todd Sargood, Matthew Slaats, Lynn Stein, Dar Williams, Grey Zeien, Donald Kimmel and Flying Swine live Theater. ecoartspace has been operating bi-coastally, with Amy Lipton in New York and Patricia Watts in the San Francisco bay area. We are celebrating our 10th anniversary this year and due to a growing presence and increased demand for ecoartspace’s unique brand of environmentalism, the time has come to open an office in New York City. ecoartspace is part of a growing community of artists, designers, scientists, curators, writers, nonprofits and businesses who are developing creative and innovative strategies to address our global environmental issues. The new Soho office space will promote a diverse range of artists whose works are participatory, collaborative, interdisciplinary and educational. Future programs and events will include exhibitions, discussions, screenings and workshops.